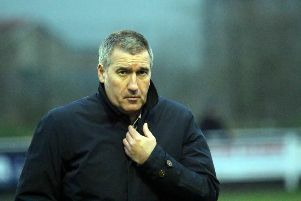 Banbury United boss Mike Ford was delighted to see his side pick up a point on the road. The Puritans ended a run of three Evo-Stik League South defeats on the road with a 1-1 draw at high-flying AFC Rushden & Diamonds on Saturday. Ben Diamond gave Rushden the second half lead in Saturday’s premier division central clash but substitute Steve Diggin grabbed the late equaliser. Ford said: “We spoke with the players before the game about protecting the point and, in the worst case scenario, coming home with one. It was a good point for us, thoroughly deserved, and a very good performance. “It was our best start away from home for a long while but I don’t think we played that much differently than we have in the recent defeats at Stratford, Halesowen and Stourbridge. We just started better than we have done recently and frustrated Rushden in the first half, which is what you have to do when you go away to big clubs.